J surprises me sometimes. We’re pretty regular customers of Cottage Inn Pizza on KL Avenue when it comes to carry-out and we almost never order from one of the big national chains. Before I went to work the other day, L said she wanted pizza. I figured that would be another call to Cottage Inn, but J threw out something new. She saw a commercial for Domino’s and it made her hungry. 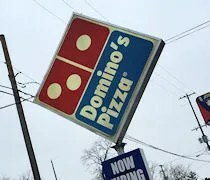 It’s been a while since we’ve ordered from Domino’s. The last time I can remember eating their pizza was when we lived on the south side of town and ordered once from the Portage location just after their big relaunch in 2010. I still needed to shower and we were kind of cleaning up the house so the plan was to do delivery, but the closest location to us was too far away for delivery. I was going to have to pick it up. We did the Choose Any 2 for $5.99 each. J really wanted the Marbled Cookie Brownie and when we added a medium 2-topping pan pizza, we got them for $6 each. We also wanted to do some cheese bread so we included an order of the stuffed cheesy bread as well. Once I placed the order, a really cool tracker popped up in the window. It told me my order was received and (Name of Cook) had started making it. It refreshed every step of the way and even though I left as soon as the order was placed, it was all done by the time I reached the light at Main and Drake. 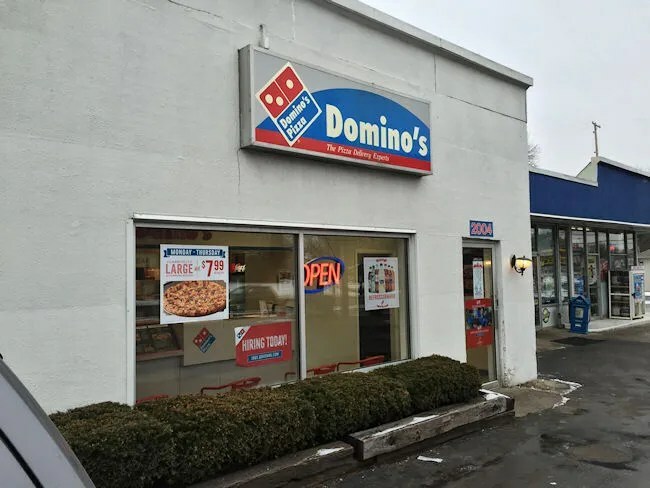 The closest Domino’s to our house is the one on West Main Street near Dartmouth Street. It’s attached to a Marathon gas station and shares a small parking lot. I noticed a couple of cars were actually parking at the KFC next door and walking to the Domino’s or gas station because it was easier to get in and out of that parking lot. My food was ready when I walked in so after paying the $22, I was on my way back home. We don’t normally order thick crust pizzas, but the pan crust was part of the deal so we went with that. 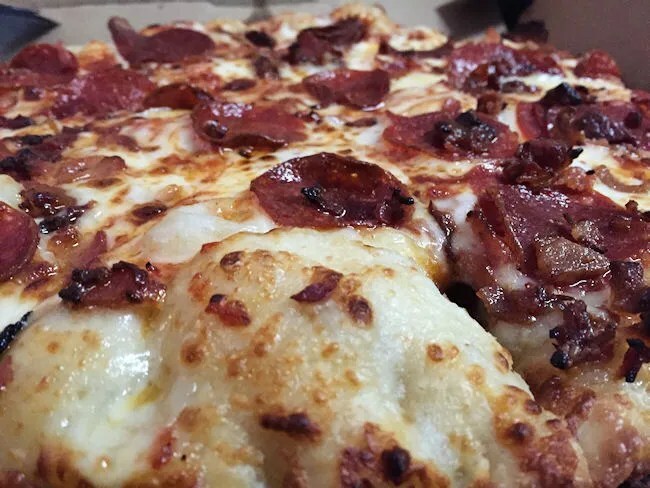 I chose pepperoni and bacon as my two toppings. The pizza came out pretty well done, which we both like. We both remarked that the pizza was a little better than typical delivery pizza. The crust had a little bit of crunch to it, but it was still soft and chewy. Kind of the best of both worlds. The meat was piled on and it all had a nice crunch to it. As far as pizza goes, it’s still a chain carry-out pizza. It’s not the best pizza you’re ever going to eat, but you could do worse. Once we started in on the pizza, I opened up the box for the Stuffed Cheese Bread. We recently discovered Erbelli’s Three Cheese Dippers. If you haven’t had them, they are to die for. We’ve gotten those instead of pizza recently. 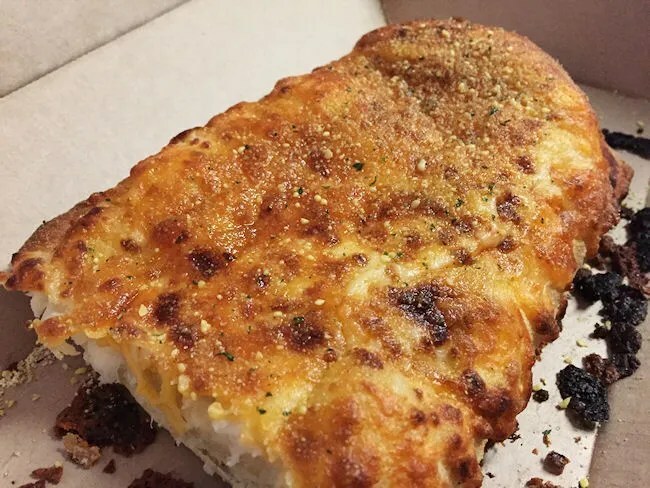 Domino’s Stuffed Cheese bread is similar, but not even on the same level, but like Erbelli’s, it can be eaten in place of a pizza. The breadstick dough is over stuffed with a mixture of cheeses then topped with a seasoning mix of garlic, parsley, and Romano cheese. I added on a couple cups of Garlic Dipping Sauce, but they could have been (they weren’t because Garlic Dipping Sauce is awesome) eaten on their own. 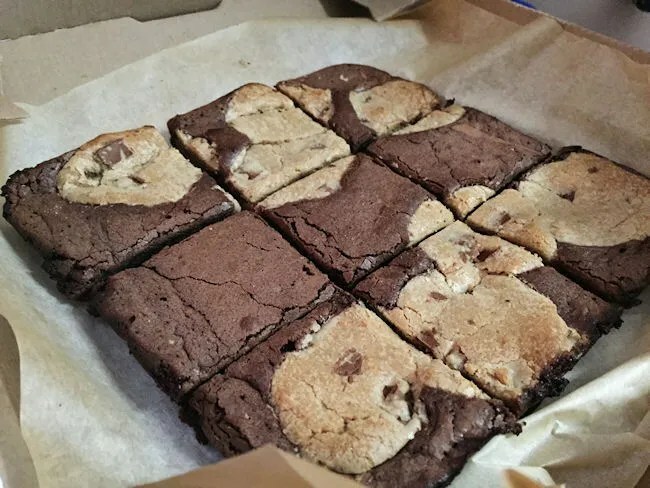 Finally, after getting L to eat a slice and a half of pizza, we opened the box containing the Marbled Cookie Brownie. 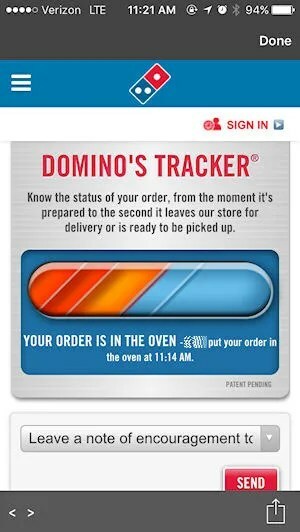 This was really the reason J wanted to order from Domino’s and it didn’t disappoint. The dessert, that was still warm, is a mixture of brownie and chocolate chunk cookie. It tastes exactly how you would expect it to taste. Sweet, chocolate, and gooey. 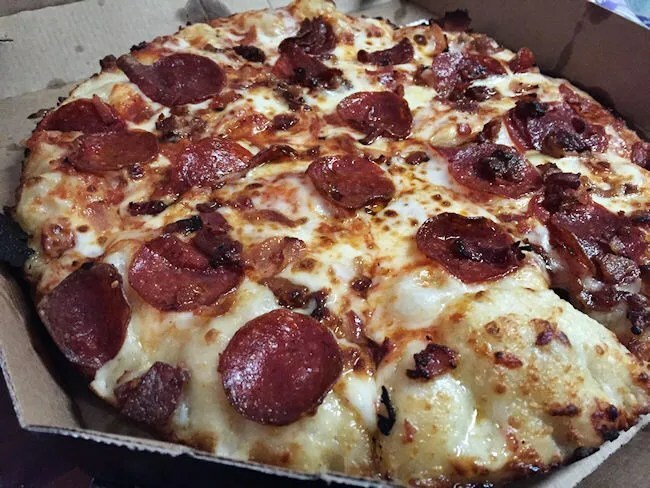 Domino’s is…well, Domino’s. We enjoyed our meal, but there’s nothing craveable about it. Would we order again, sure we would. Everything tasted just fine and we all felt satisfied once we condensed boxes down to one little one of leftovers. The stuffed cheese bread was a big hit and the pizza wasn’t bad. We’re just kind of creatures of habit and when we want the cheap(er) carry-out option, we’re kind of set on Cottage Inn.